Original posted on the ECF blog, where you can find complete information. Photo from the Idea Camp 2015 by Julio Albarrán. The Idea Camp 2014 took place in Marseille, France and focused on the topic “Connected Action for Public Space”. 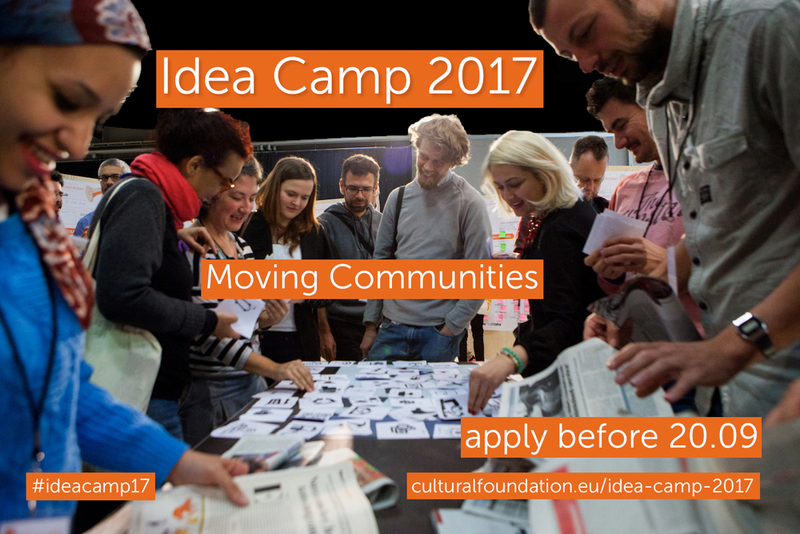 The Idea Camp 2017 will take place in Spain on 1-3 March 2017 and will focus on the theme “Moving Communities”. Your idea might reflect one or several of the issues aforementioned. We invite you to carefully read the application guidelines before submitting your idea. If you have any questions, we are hosting two online Q&A sessions on 6 July and on 7 September, both from 12:00 to 13:00 CET, on Facebook and Twitter. You can join us there. Following the Call for Ideas, 50 participants will be selected according to the guidelines. ECF will cover travel costs and all expenses related to the stay in Spain during the Idea Camp for a maximum of one representative for each idea. After the Idea Camp, participants will be invited to submit a concrete plan for further research or investigation of their ideas. A total of 25 proposals will be selected and consequently awarded an R&D Grant, up to a maximum of €10,000 each.